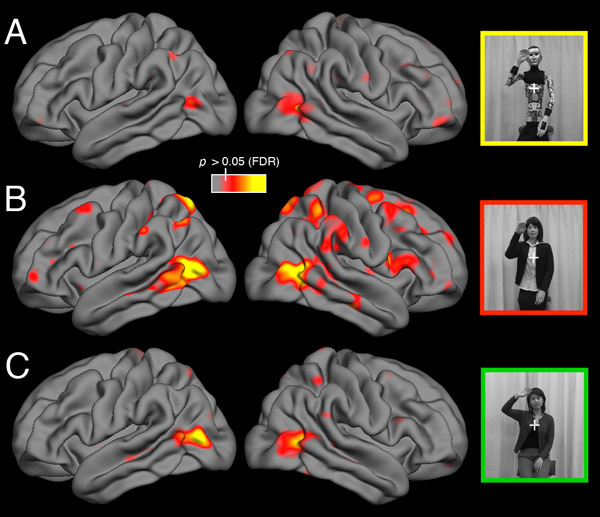 Abstract: Using fMRI repetition suppression, we explored the selectivity of the human action perception system (APS), which consists of temporal, parietal, and frontal areas, for the appearance and/or motion of the perceived agent. Participants watched body movements of a human (biological appearance and movement), a robot (mechanical appearance and movement), or an android (biological appearance, mechanical movement). With the exception of extrastriate body area, which showed more suppression for humanlike appearance, the APS was not selective for appearance or motion per se. Instead, distinctive responses were found to the mismatch between appearance and motion: whereas suppression effects for the human and robot were similar to each other, they were stronger for the android, notably in bilateral anterior intraparietal sulcus, a key node in the APS. These results could reflect increased prediction error as the brain negotiates an agent that appears human, but does not move biologically, and help explain the “uncanny valley” phenomenon. Lovecraft, H. P. (1936). The Shadow Over Innsmouth. In The Dunwich Horror and Others, S. T. Joshi, ed. Sauk City, WI: Arkham House. Hetfield, J., Ulrich, L. and Hammett, K. (1986). The Thing That Should Not Be. In Master of Puppets, Electra Records. This entry was posted in Academia, Humor, News, Publications, Science, Test and tagged brain, fMRI, Humor, Lovecraft, Metallica, neuroscience, News, papers, publication, robots, Science, uncanny valley on 23 March, 2011 by asaygin.